Did you know that the average British mother selflessly spends 32 hours a week doing a wide variety of jobs for their families? A recent study1 has quantified the myriad of weekly chores undertaken by good old Mum, including chef, chauffeur, accountant and cleaner. It concluded that if Mum earned average industry rates for all these activities, she could expect to be paid a staggering £17,582 per annum. Cleaning ranks as one of the most time-consuming jobs done for the family, taking an average of 180 minutes a week. Closely followed by cooking, which accounts for 174 minutes, then housekeeper (138 minutes), counsellor (114 minutes), personal assistant (108 minutes), teacher (90 minutes) and story-teller (78 minutes). The study also indicates that in 78% of UK homes, Mums take on more roles than Dads. The vast majority of mothers polled (94%) said that their heavy combined workload inside and outside of the home has caused them to put off or delay exercising, planning for their family’s financial future or even visiting the hairdressers. Bringing up a family can be an all-consuming experience, so it’s hardly surprising that financial planning and things like arranging life insurance aren’t always at the top of a parent’s to-do list. It’s easy to take the contribution Mum makes for granted. But if she was no longer there, many families would find themselves having to pay for domestic and childcare services. 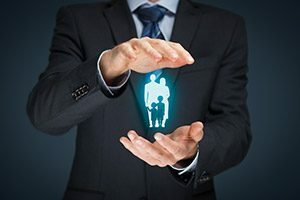 Life insurance is arguably one of the most important financial products anyone can take out and one of the best ways of leaving your family provided for financially. It can provide a lump sum payable on death, or the diagnosis of a critical illness. Over the years, hundreds of thousands of families have been grateful that having life cover has enabled their family to cope financially following the death or illness of a loved one. It is a common misconception that insurance is expensive; many people are surprised to learn that life insurance is cheaper than they think. The cost of life cover has fallen considerably over the past few years. It’s a relatively small price to pay when you consider that having no insurance would cost you and your family considerably more. Life insurance isn’t just about having a lump sum payable on death, it is as much about providing the life you’d want your family to enjoy if you weren’t there to provide for them. This includes protecting their home, enabling debts to be paid off, providing for their care and their education. It is a versatile product that can help protect you and your family at every stage of your life. Your adviser can help you find the right policy with the right level of cover to meet your changing needs. Although the role of Super Mum offers no holidays or sick days, 97% of those questioned said being a Mum is the best job in the world.